It was snowy in Kamifurano town this morning. The temperature was minus 2.4 degrees on 5 o'clock in the morning. I run about 13 miniutes and 3.0 kirometers. 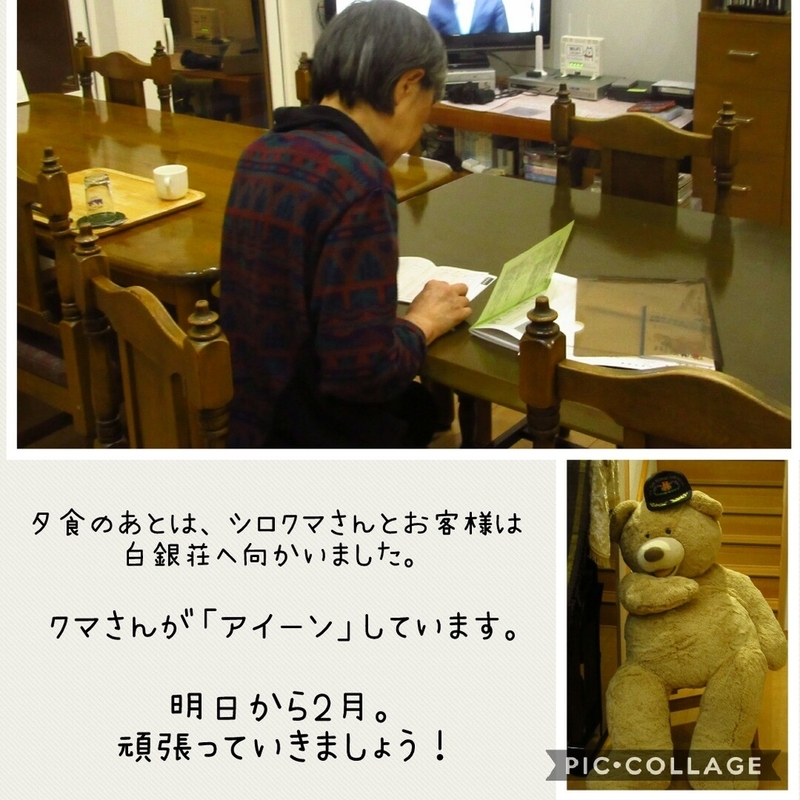 The family who come from Hong-kong had departured Stella. They had breakfast at 6 o'clock. After they go for Abashiri. 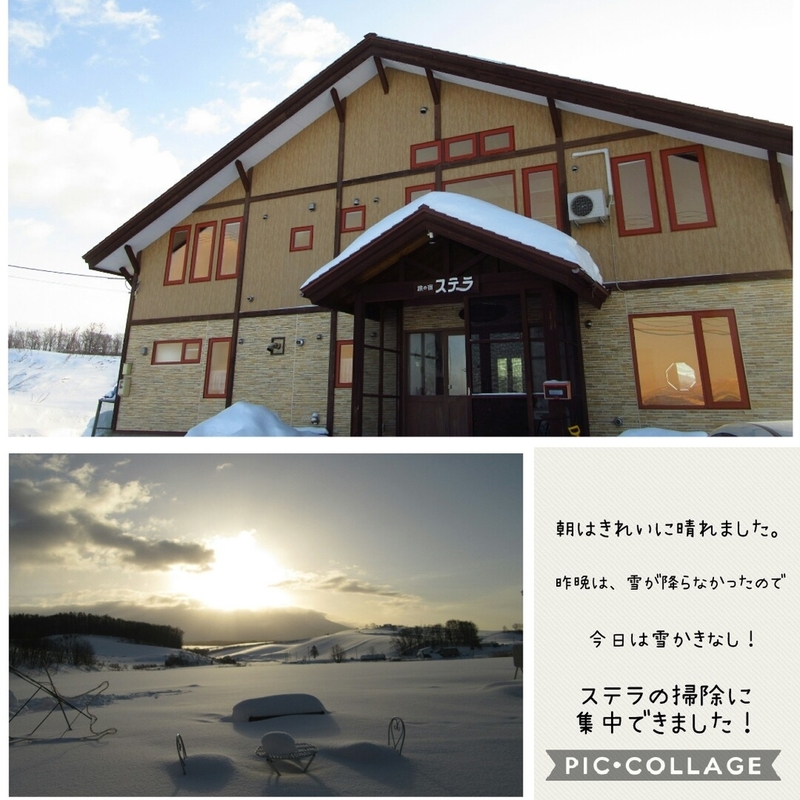 I went to Furano for work after clean in Stella rooms. 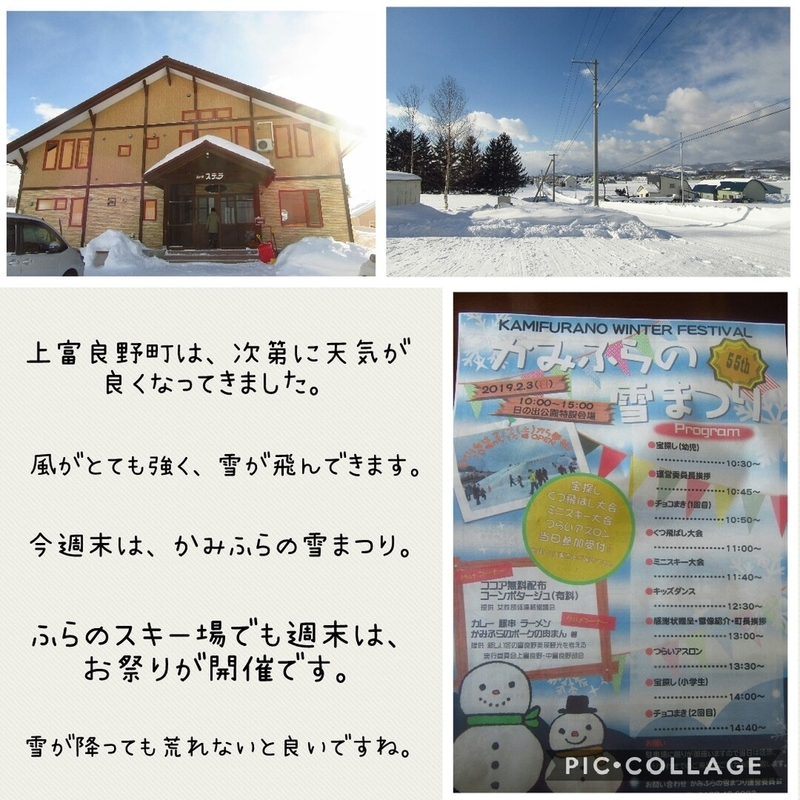 It was many snow in Furano city. 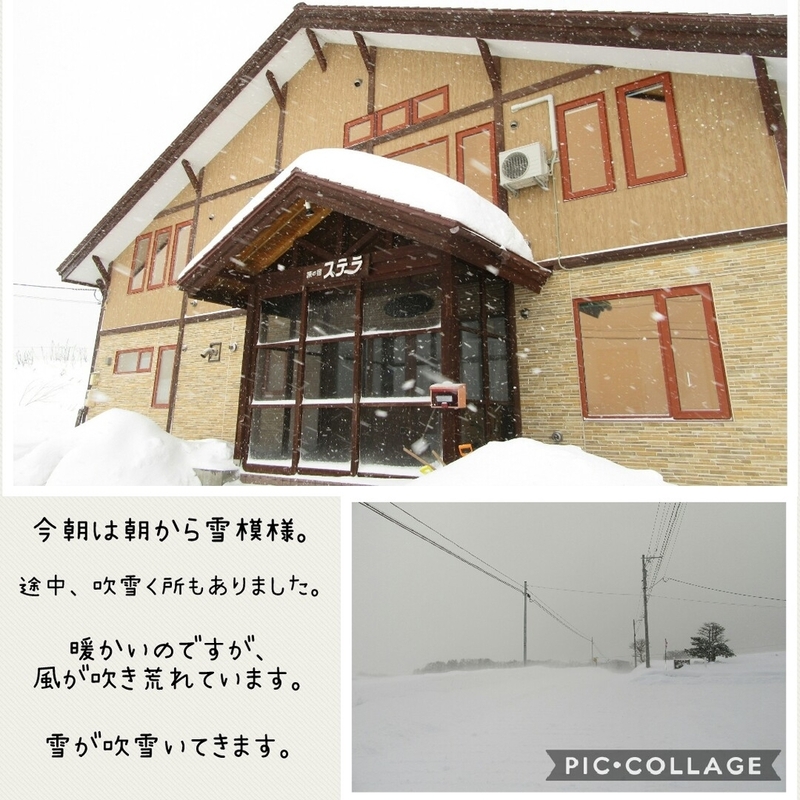 Furano area was warm today, so snow was very heavy. After work, I run about 45 minutes. Then I came back Stella and cleaned snow aroud Stella about a hour. 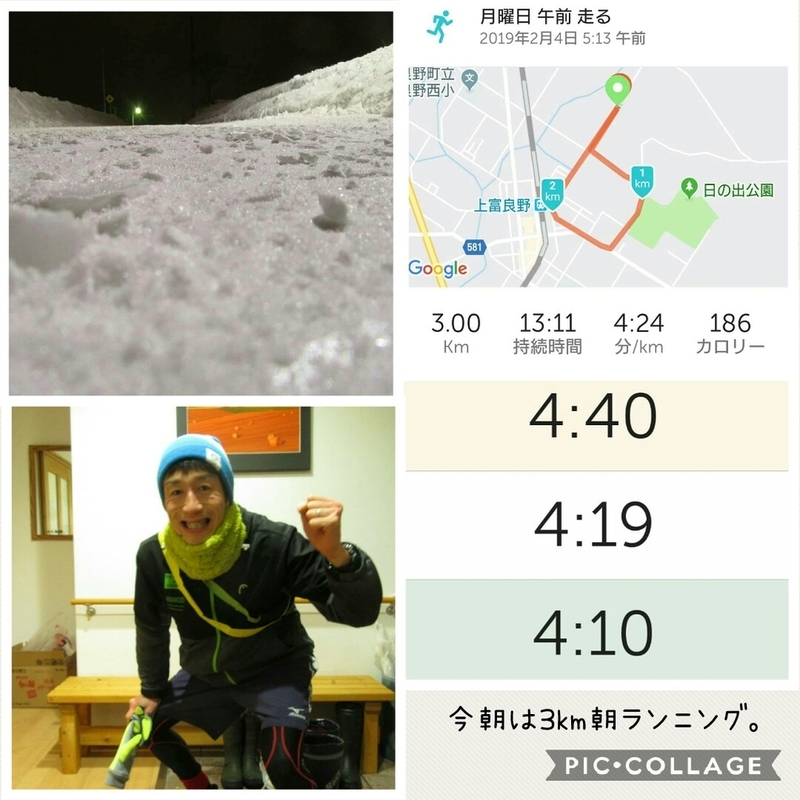 There were many snow some zone. The guests who come from Korea, Taiwan stay Stella tonight. 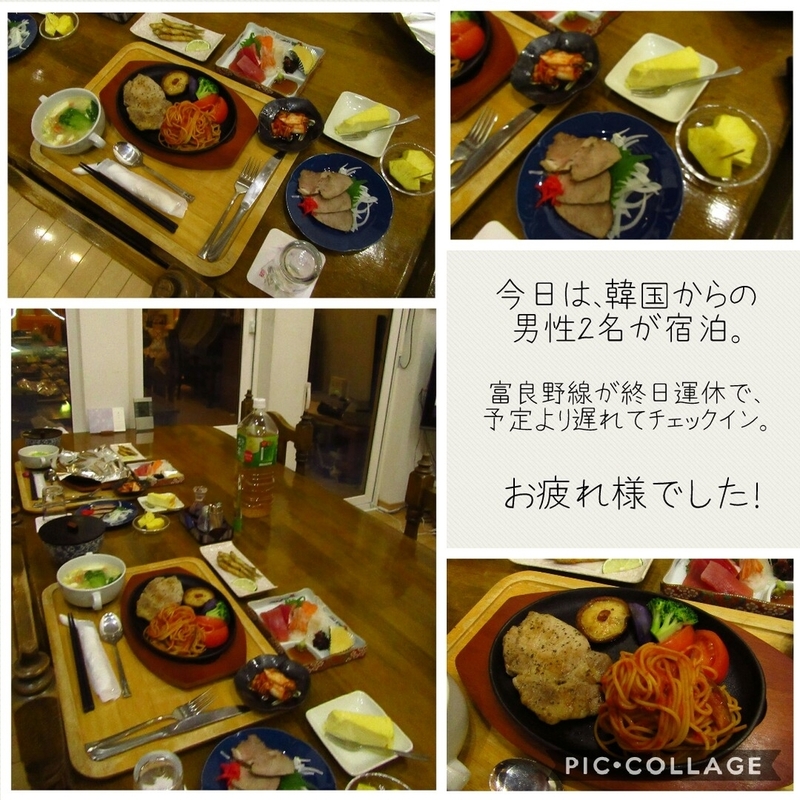 4 guests had dinner together. It is very strong wind in Kamifurano town now. I wish the wind is low gradually. The temperature was minus 11.7 degrees on 5 o'clock in the morning. I run 34 miniutes and 7.2 kirometers. The guest men who come from Korea had departured Stella today. Today was fine day in town. 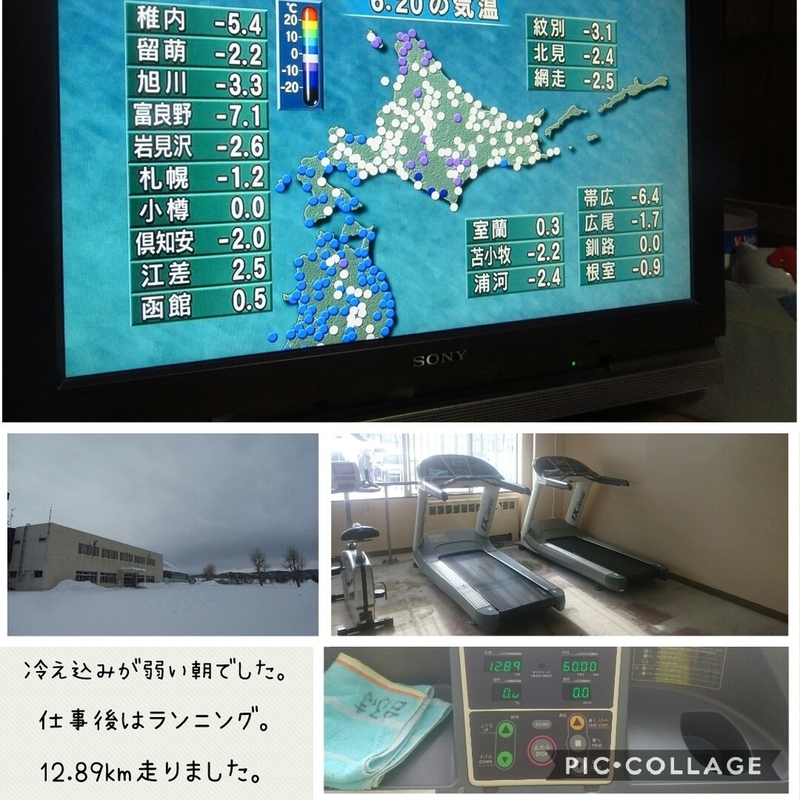 This morning was little cold, but in afternoon was fine degrees. We don't have need to clean snow, so it was good. 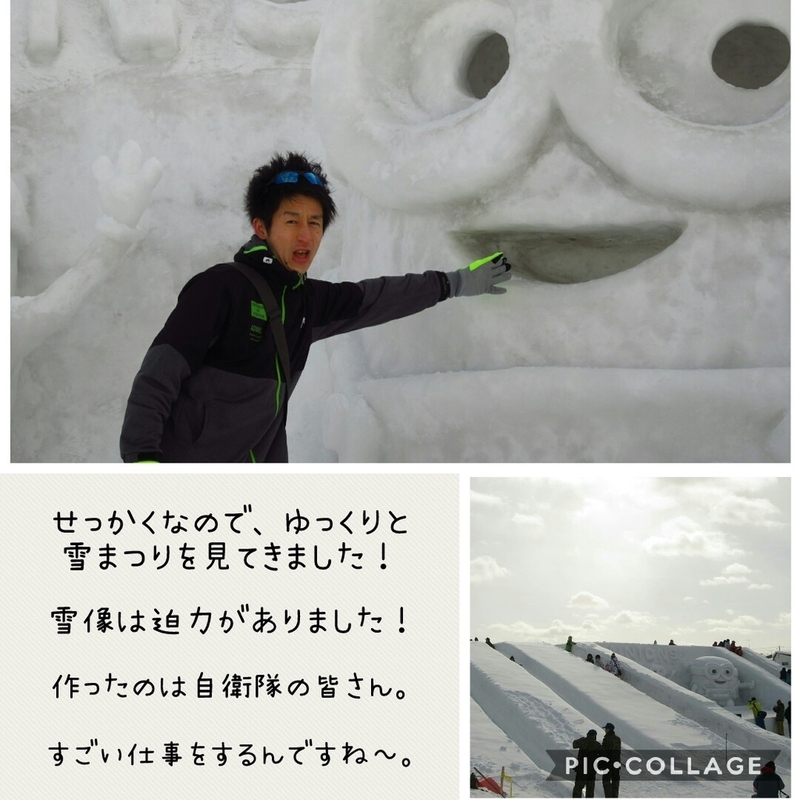 I went to Kamifurano snow festival with wife. 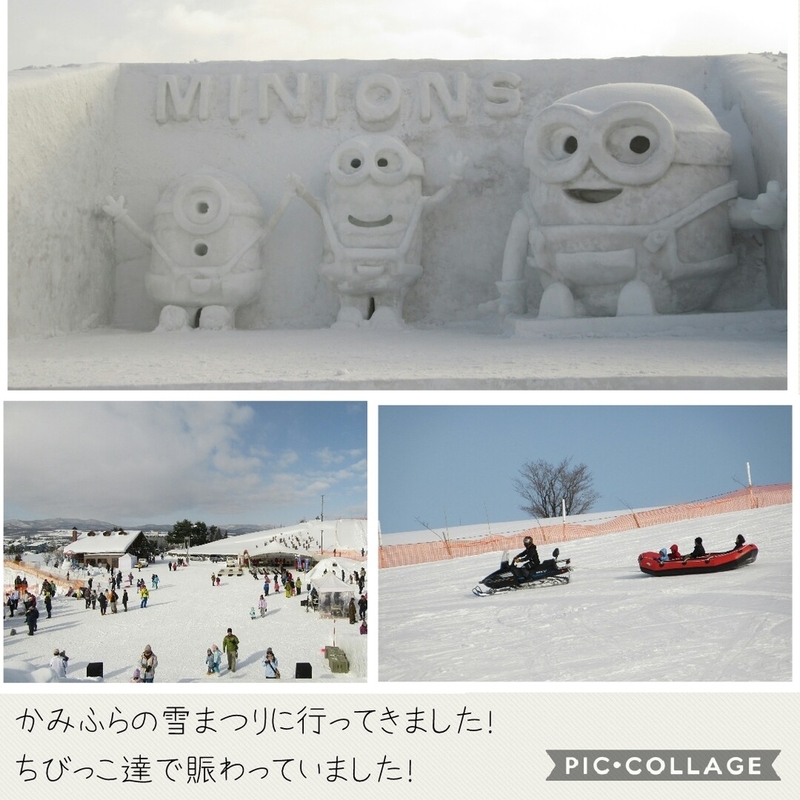 There were Minion's snow doll and big ice slider, so adult enjoyd festival,too. The family who come from Hong-kong stay Stella tonight. 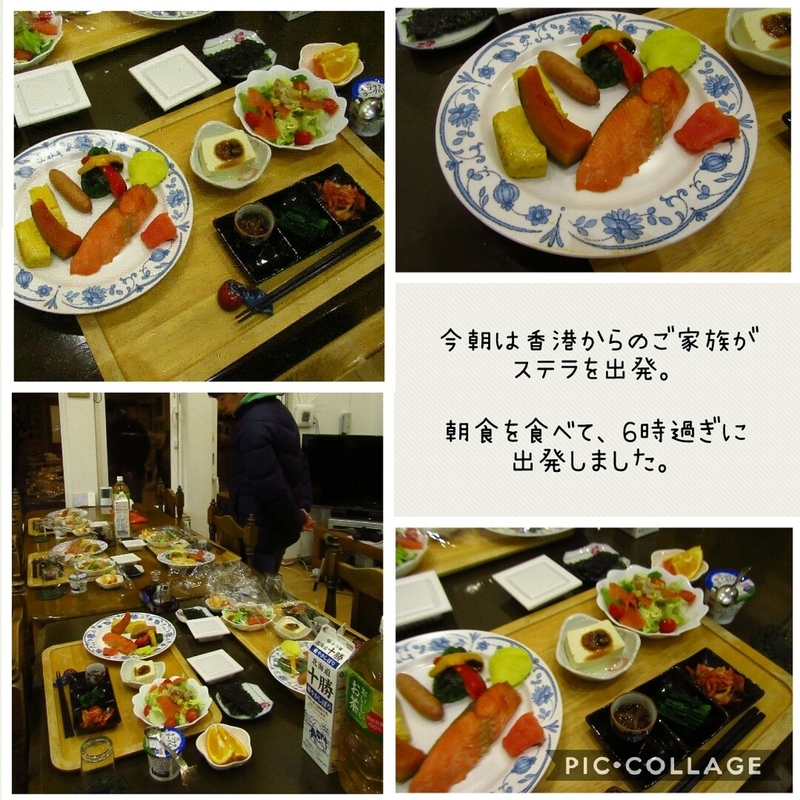 5 guests had dinner together. I went to hotsprings with guests. Last is very big news. 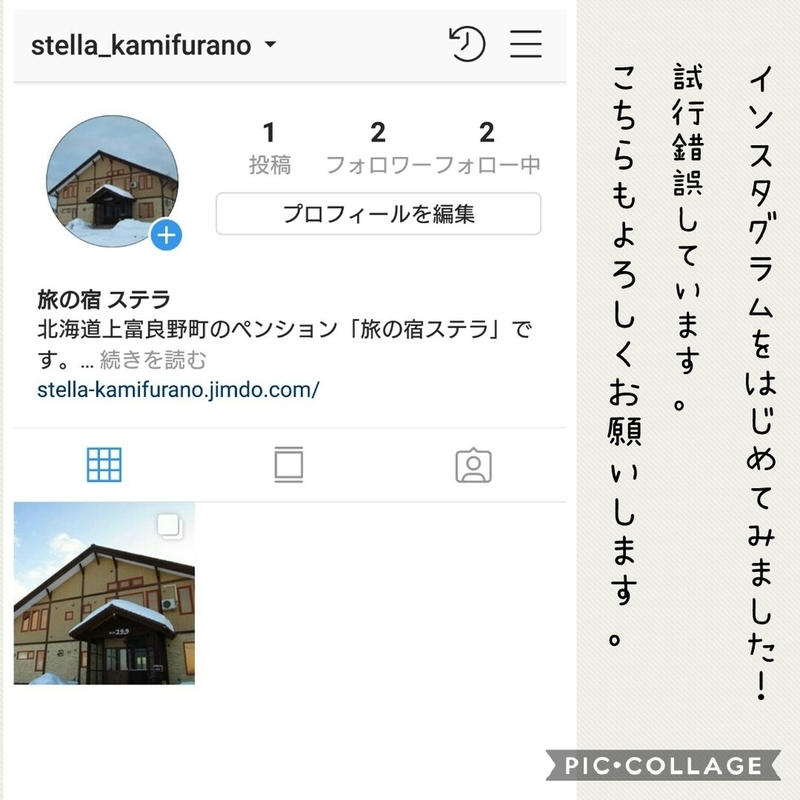 We started instagram in Stella in Kamifurano. 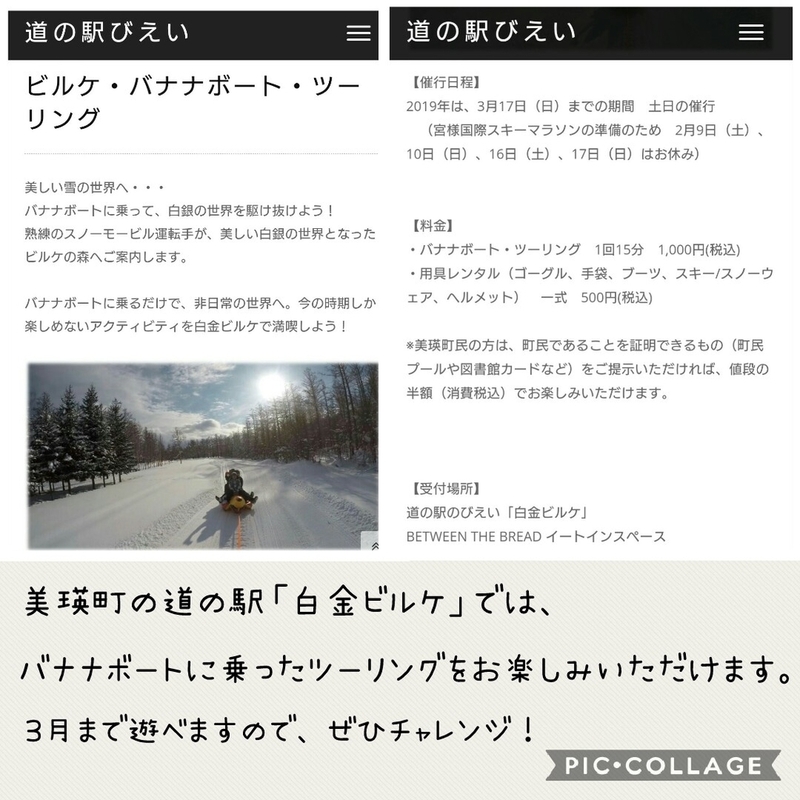 I try to uproad both blog and instagram. 4th will be cloudy after snowy in town. 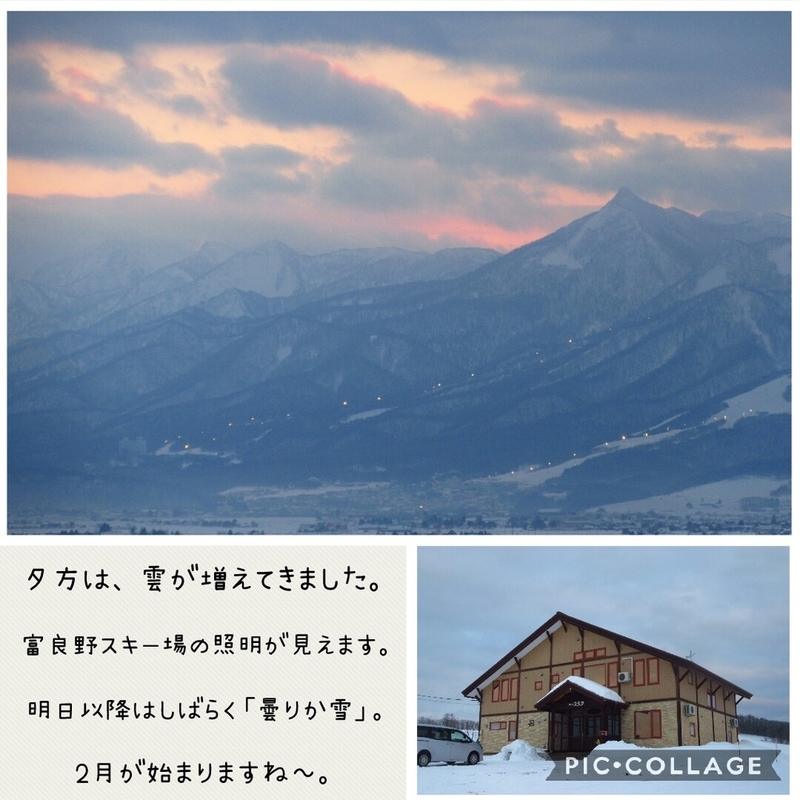 Many snow comes Kamifurano town tomorrow. The temperature was minus 9.0 degrees on 6 o'clock in the morning. I run only 5 miniutes after cleaned snow around Stella. I run about 1.1 kirometers. 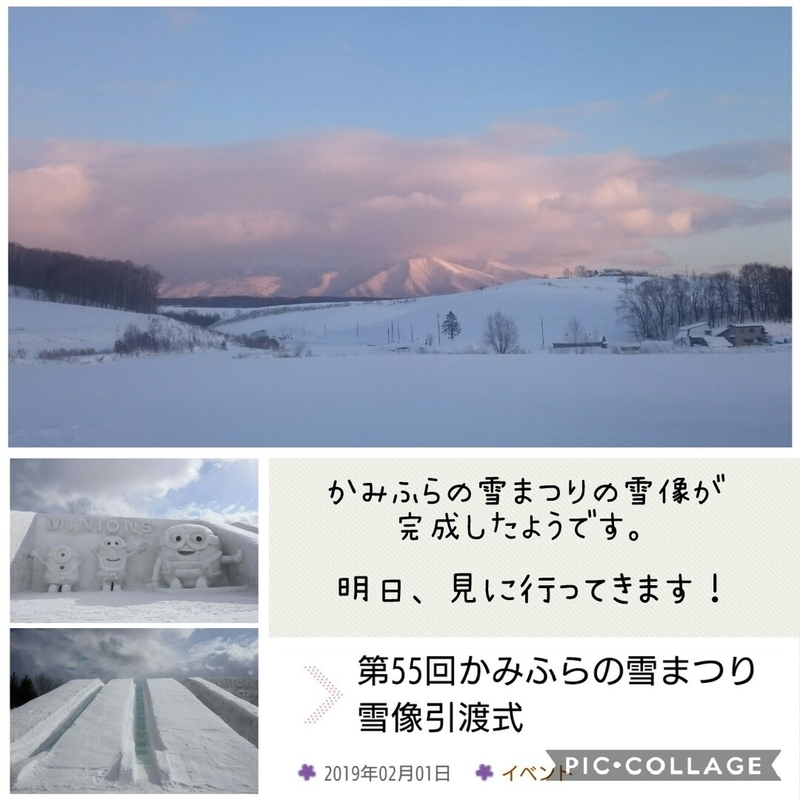 Furano city snow was more than Kamifurano town a little. In afternoon, it was sunny. Came back to kamifurano town, and had lunch in Stella. 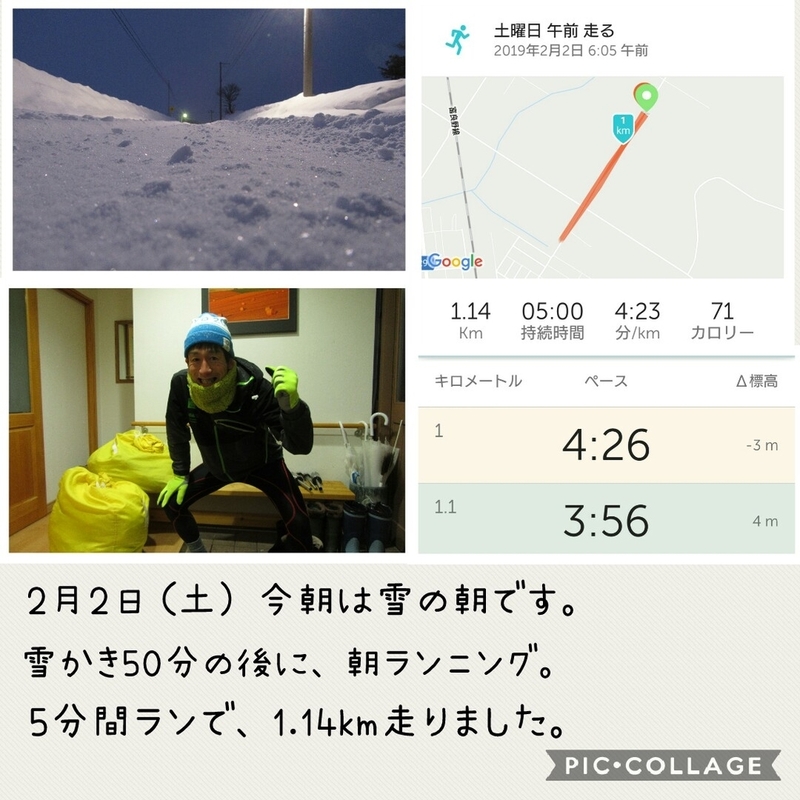 After, I tried to clean snow sencond times. 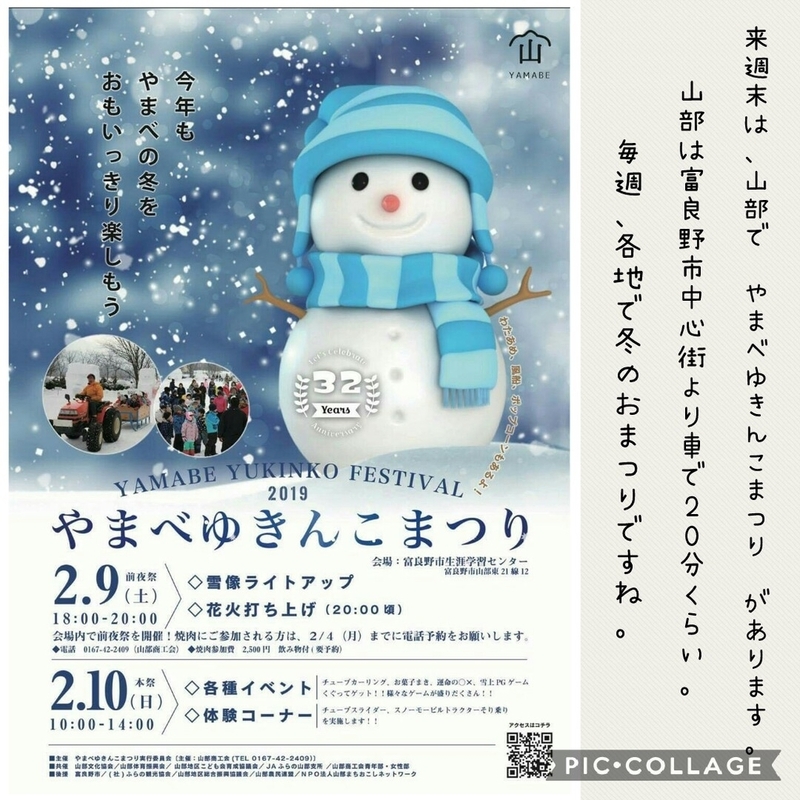 Kamifurano snow festival will hold tomorrow. So, I will go to there tomorrow. The guests who come from Korea stay Stella tonight. They made snow doll. I will introduce tomorrow. Furano line was stopping today, so they were tired. 3rd will be sunny in town. Please enjoy Sunday. Good night. The temperature was minus 9.5 degrees on 5 o'clock in the morning. I run 20 miniutes and 4.4 kirometers. 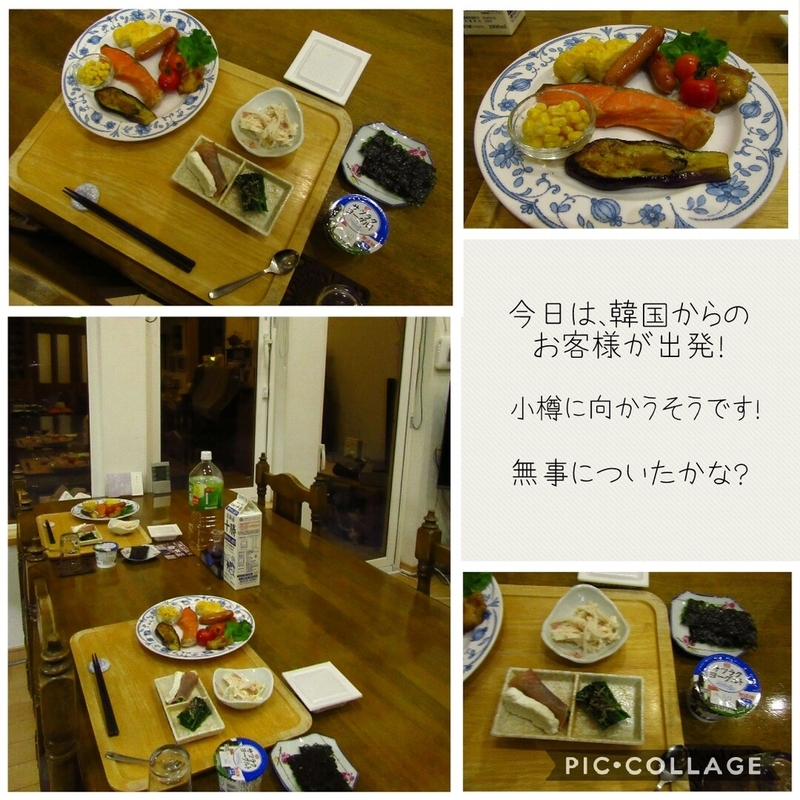 The guest who come from Shimada had breakfast slowly. 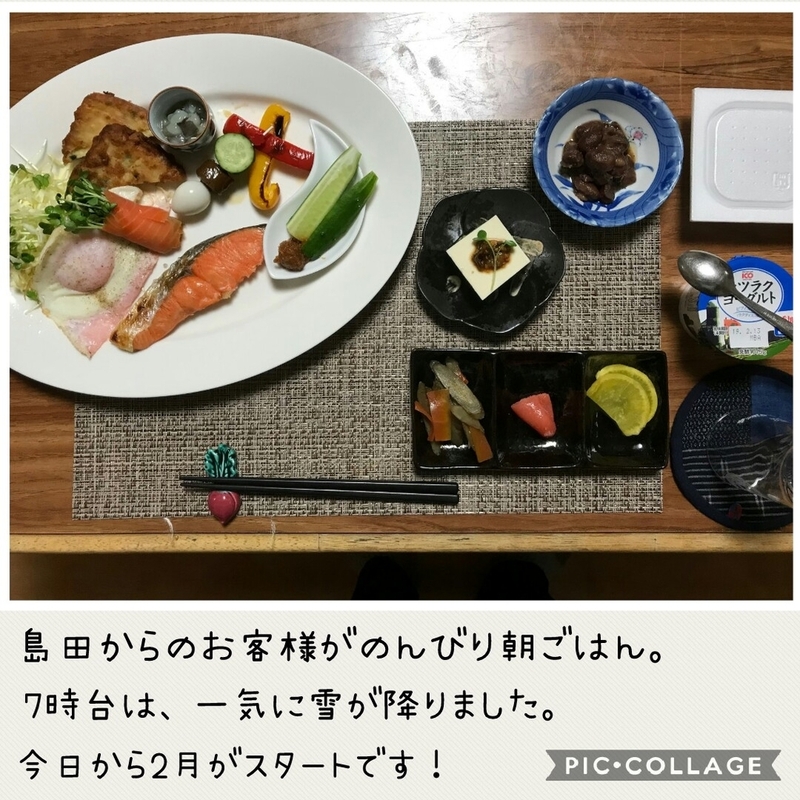 It may be very precious for guest to have breakfast slowly. It was sunny in Kamifurano town before afternoon. But it was very very strong wind. When we cleaned snow around Stella, it was very cold. It will be strong wind until tonight. 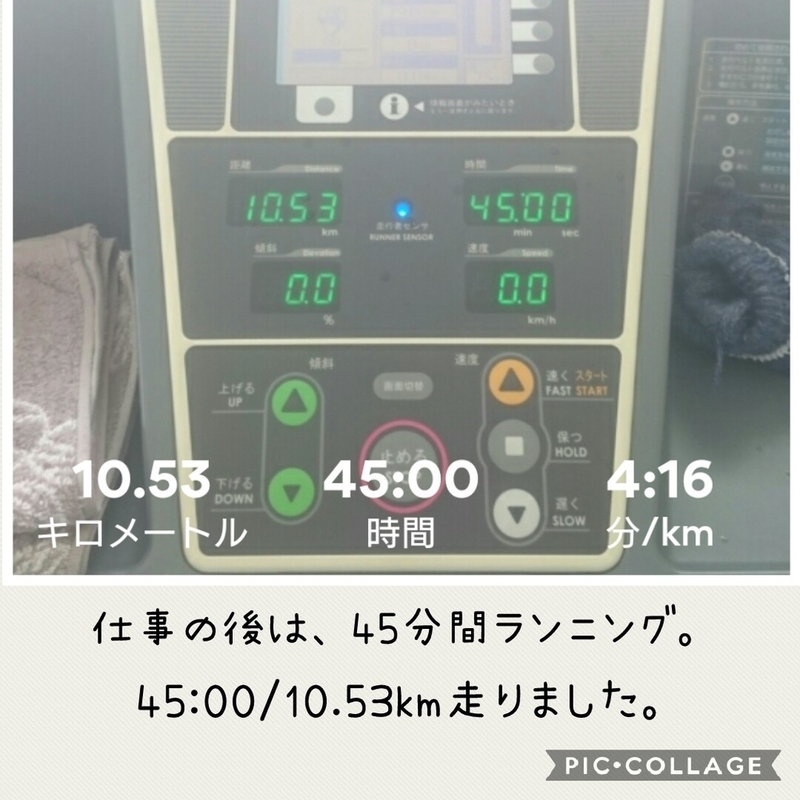 In afternoon, I run a hour in kamifurano arena. We can use free 2 weeks, so I will go many times. 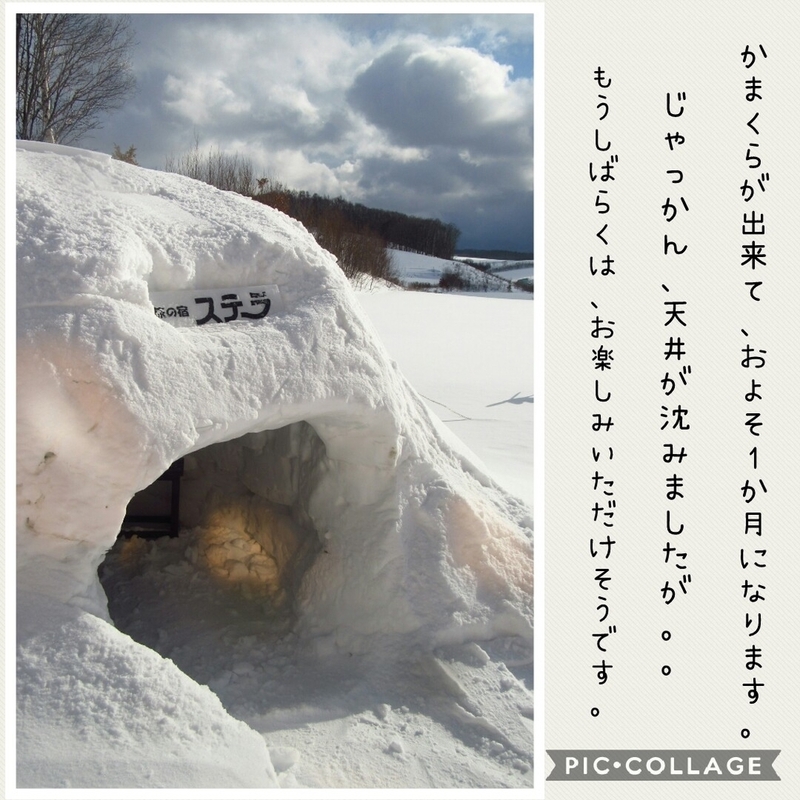 Stella's snow dome（Kamakura） has built about a month. 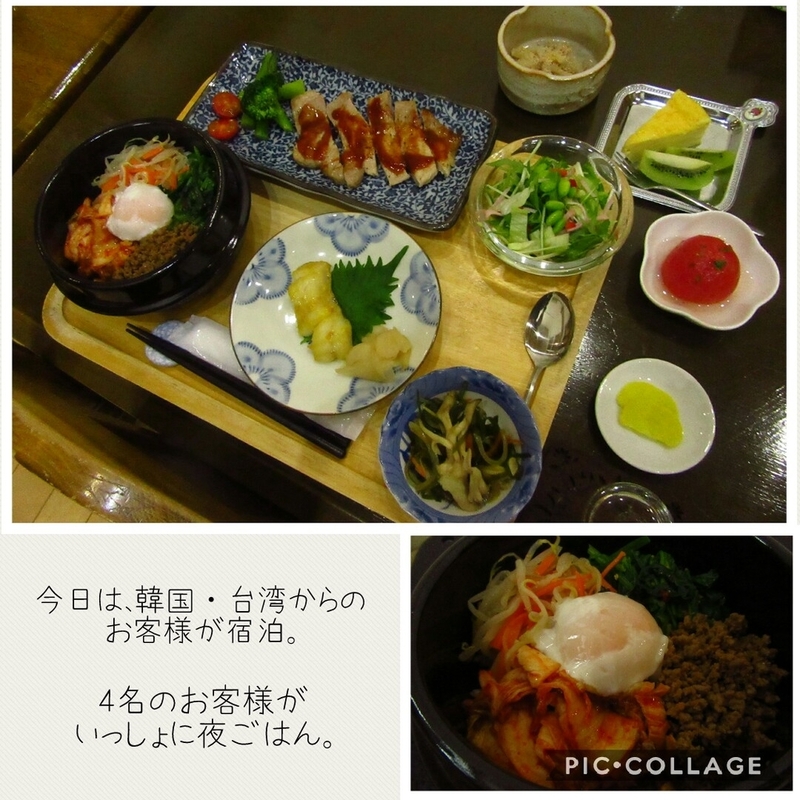 Guests will enjoy kamakura until before March. 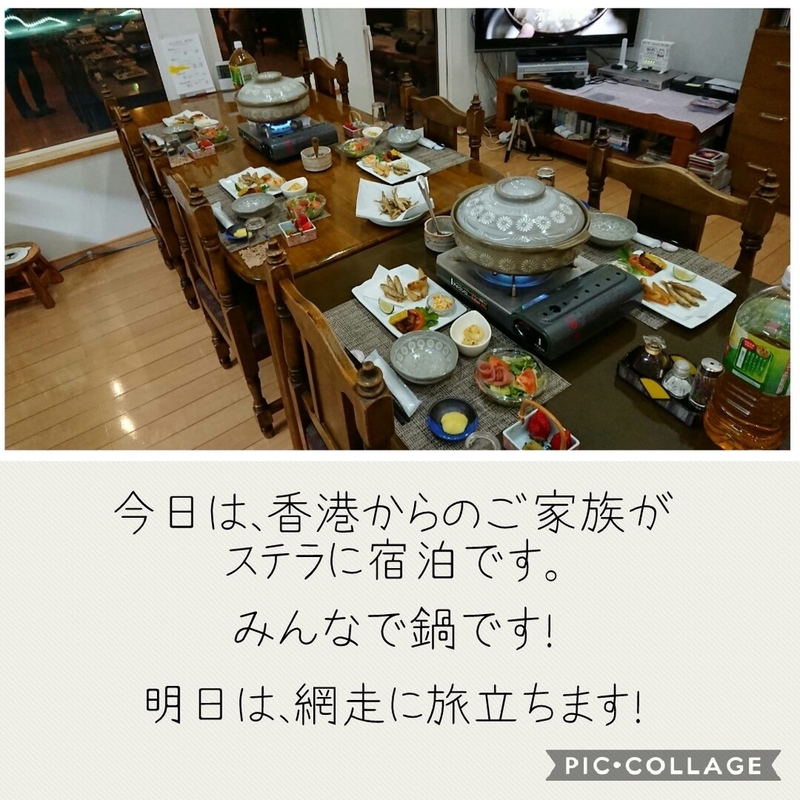 The guests who come from Korea,Shimada,Kawasaki stay Stella tonight. 2nd will be cloudy after snowy in town. The temperature was minus 3.4 degrees on 5 o'clock in the morning. This morning was very strong wind. I run 15 miniutes and 3.25 kirometers. Gradually, it was fine day this morning. But it was very strong wind today. There are many festival in Hokkaido area, so I wish it will be fine day. Before afternoon, I and wife went to Asahikawa city for shopping. 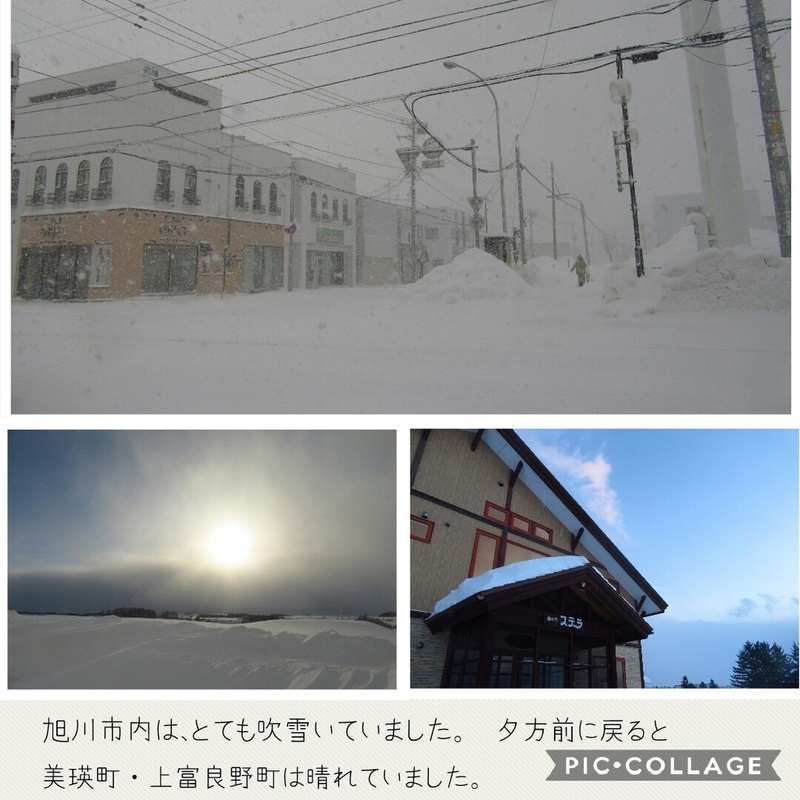 Gradually, it was snowy......and Asahikawa city was snowstorm. 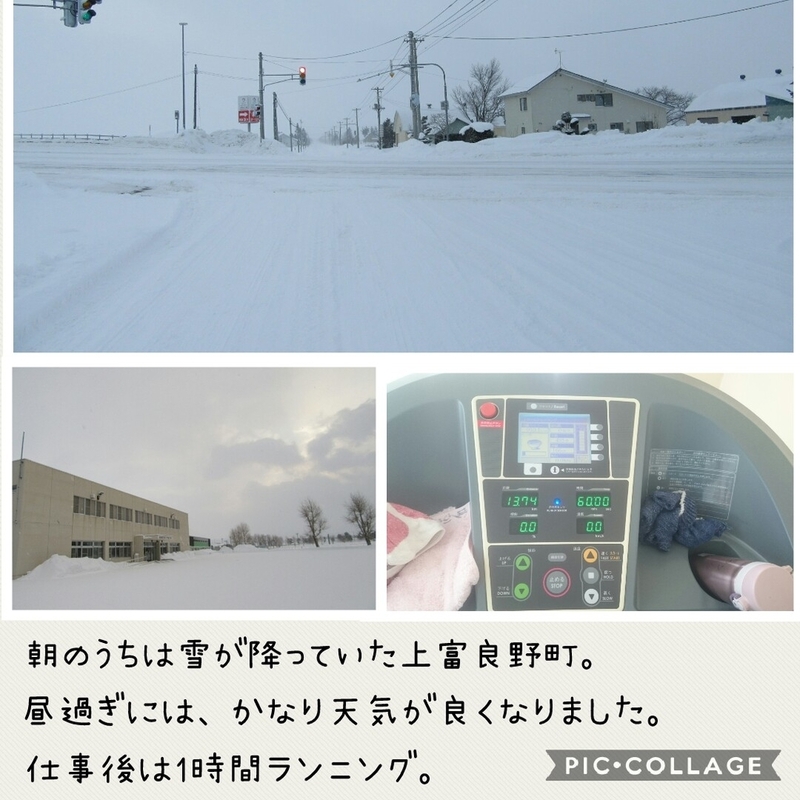 It was bad condition, and slow drive, so I have many times. Came back to Kamifurano town, it was sunny in the sky. 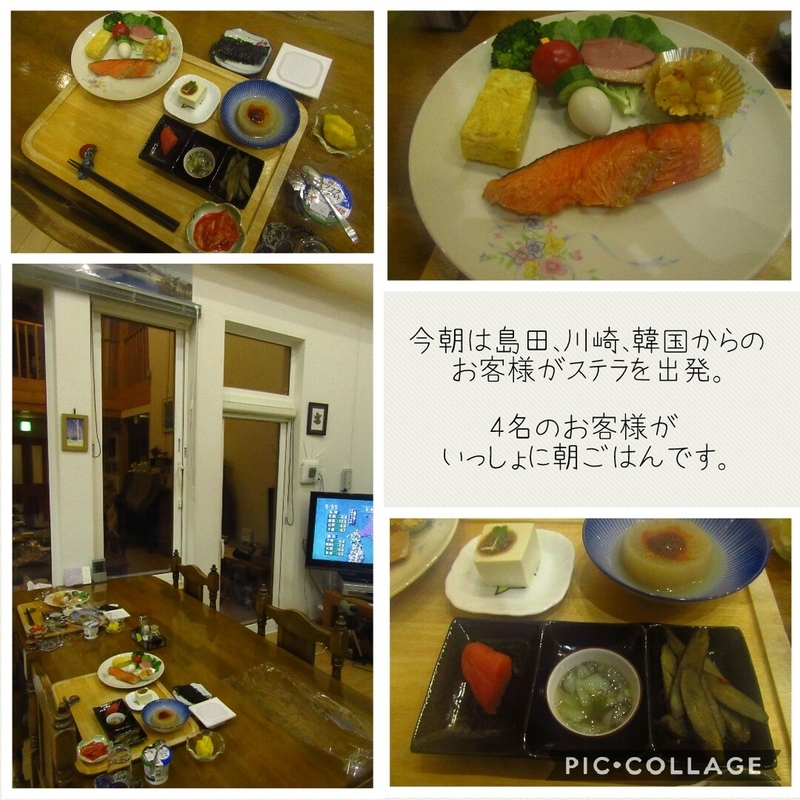 The guest who come from Shizuoka stay Stella tonight. The last is activity in Biei town. hand made aroma in Biei town. 1st will be cloudy in town. From tomorrow is February. Let's try to hard. The temperature was minus 18.4 degrees on 5 o'clock in the morning. 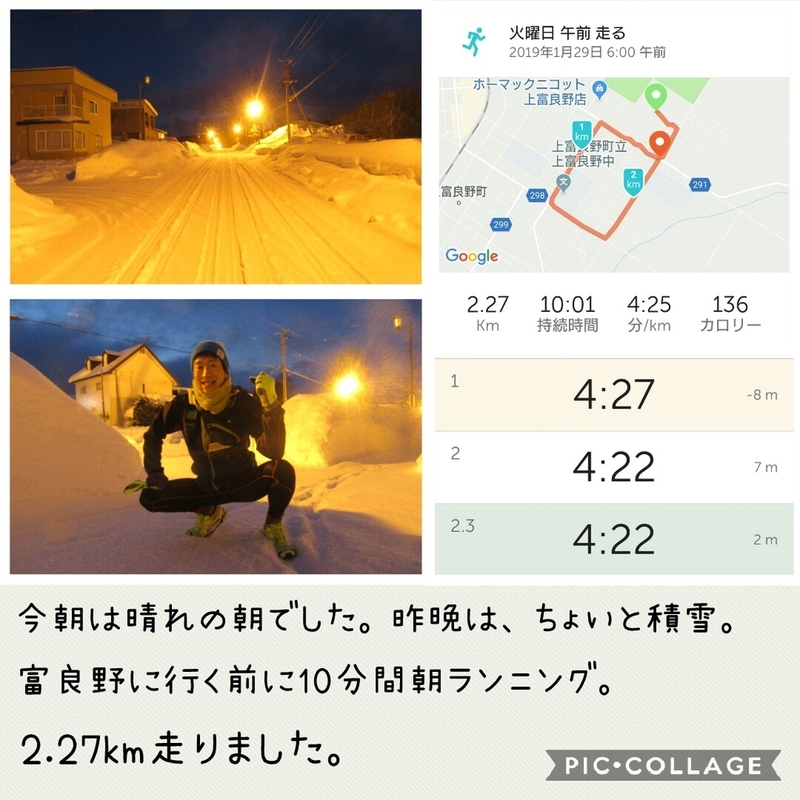 It was very cold morning for a long time. I run 10 miniutes before work and 2.2 kirometers. 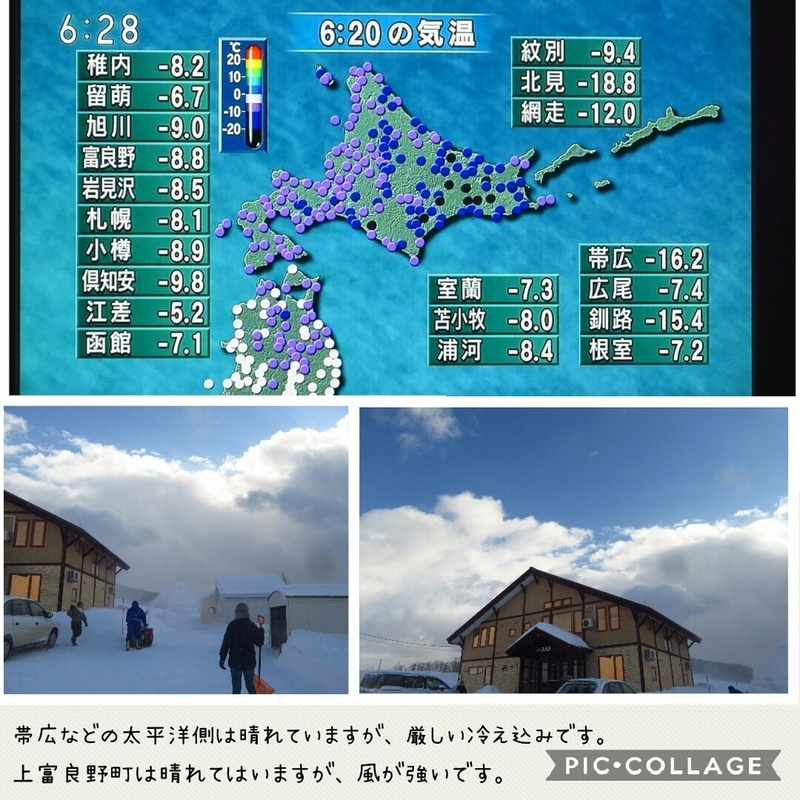 In Hokkaido some areas were the most coldest morning this winter. 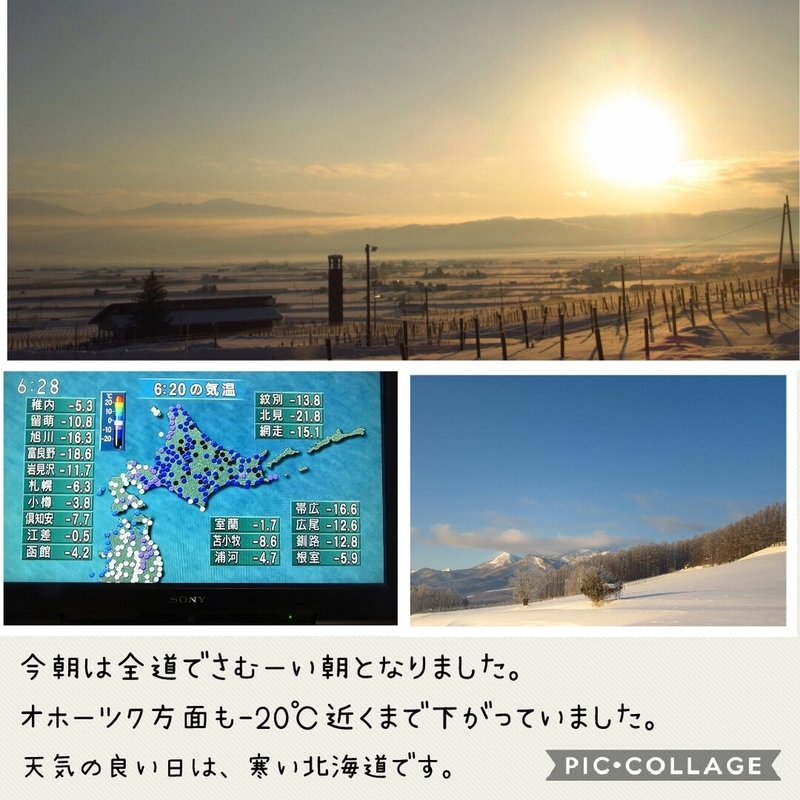 Sunny day is very cold in Hokkaido. On the work way, I saw a lot of cameraman. They took a sunrise picture. 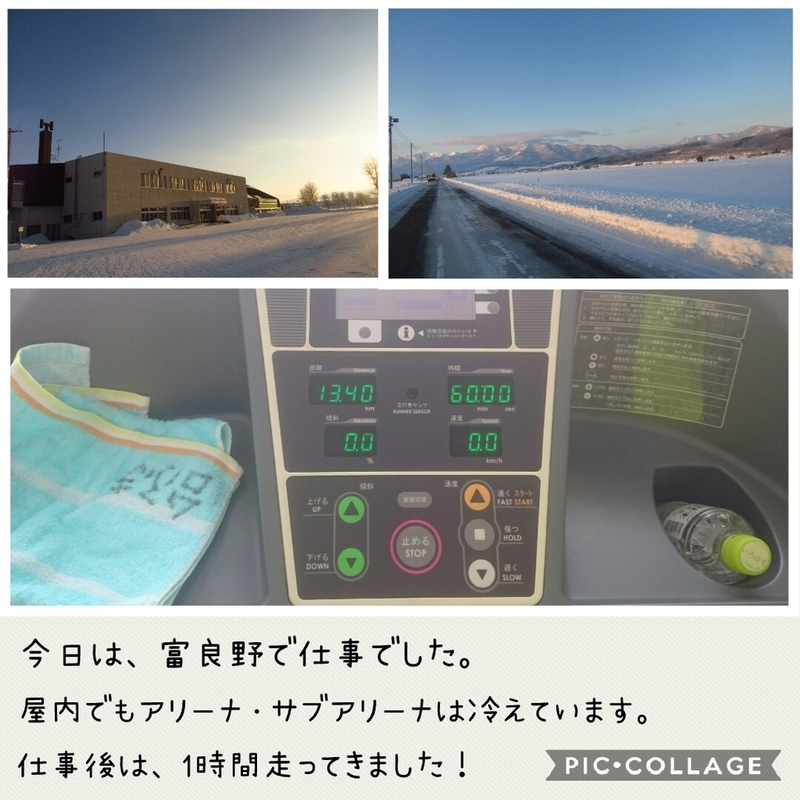 I worked Furano form morning. In sports center was very cold, and we need many times to warm in arena. 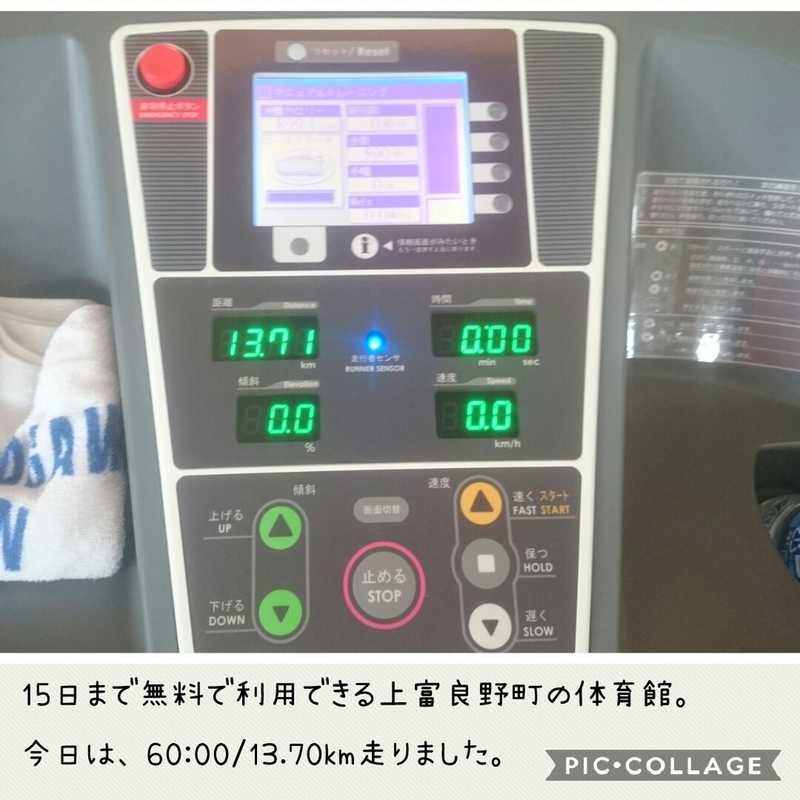 After work, I run about 13.40 kirometers. 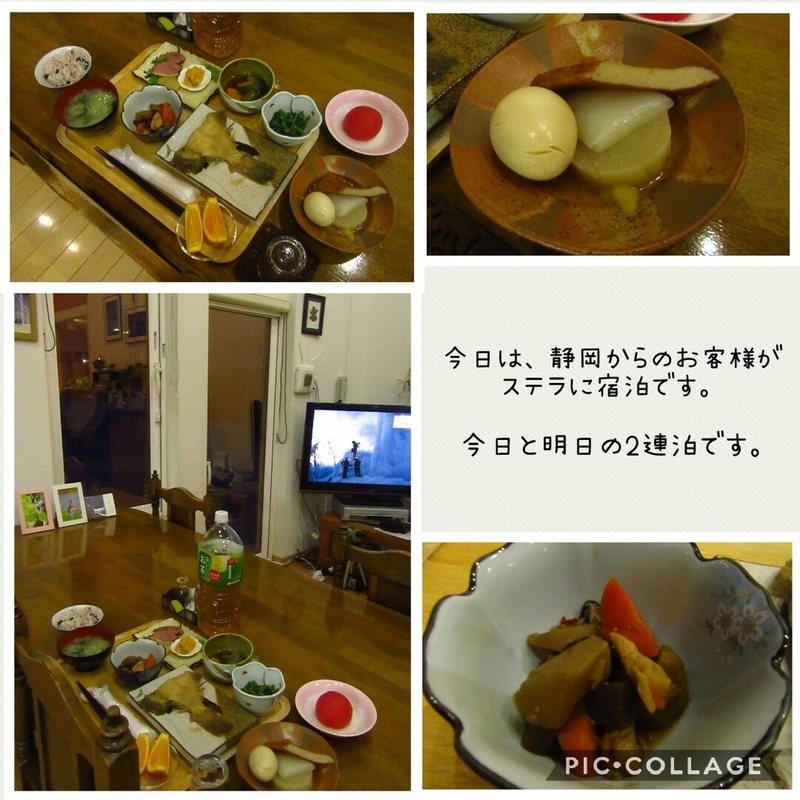 I came back Kamifuranotown, and had lunch in house. Before evening, I went to shopping and took a pictures. 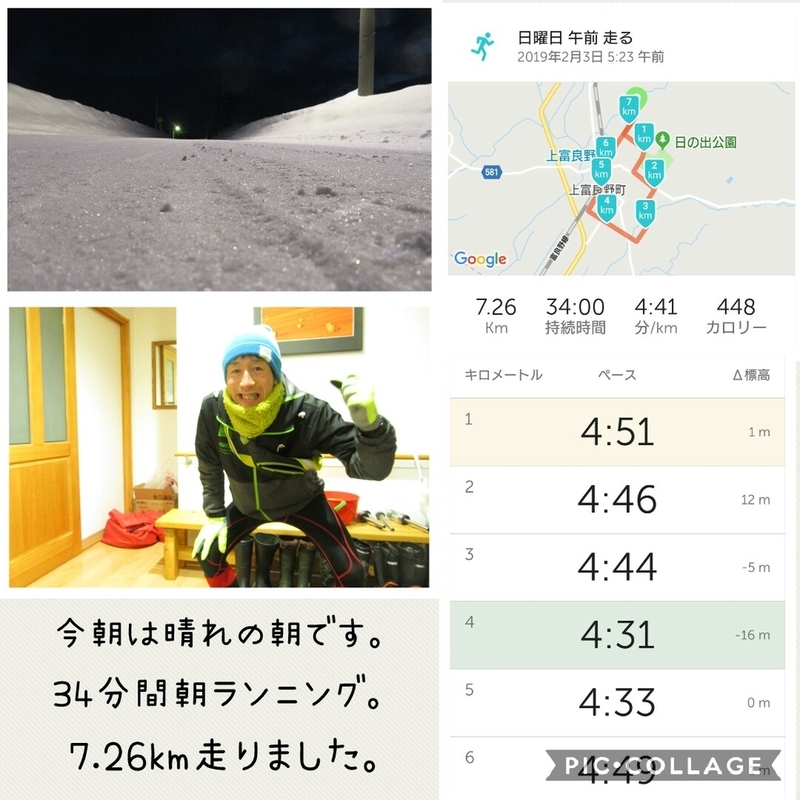 I could see many lights in Furano ski course. I could see beautiful seane, but tomorrow will be bad weather gradually. 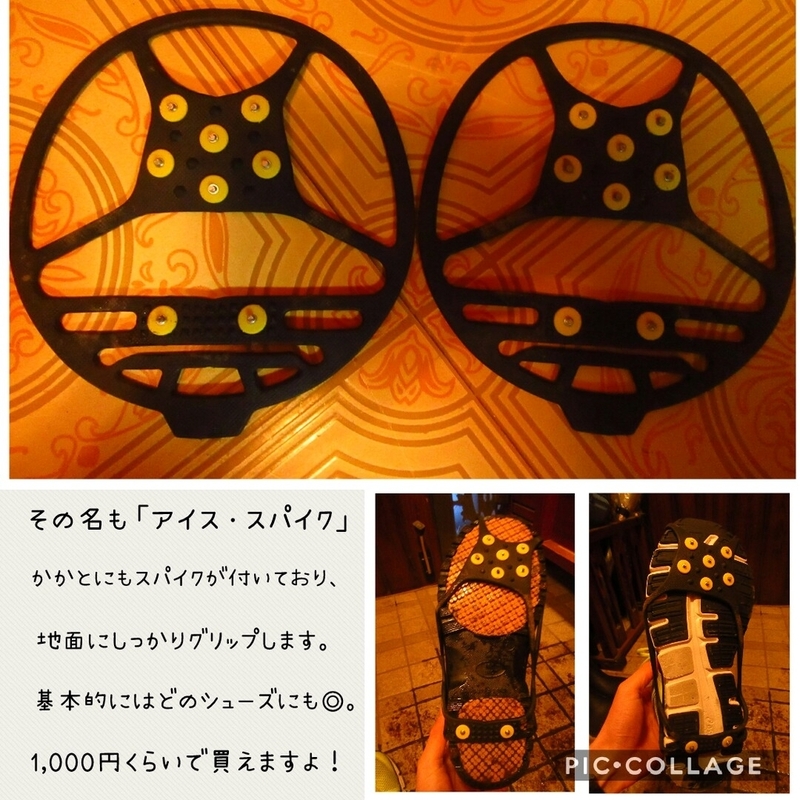 I introduce useful items in Hokkaido. This is cleat. We set it back in shoes. I use it running shoes and boots. 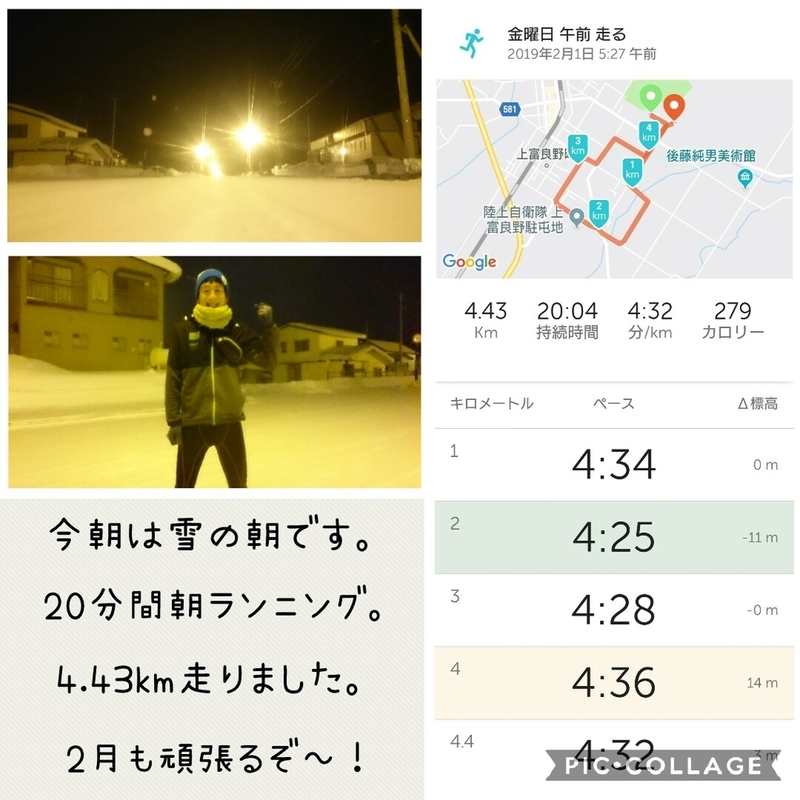 It is safety for us to walk on snow road. We can buy about 1 thousand yen. 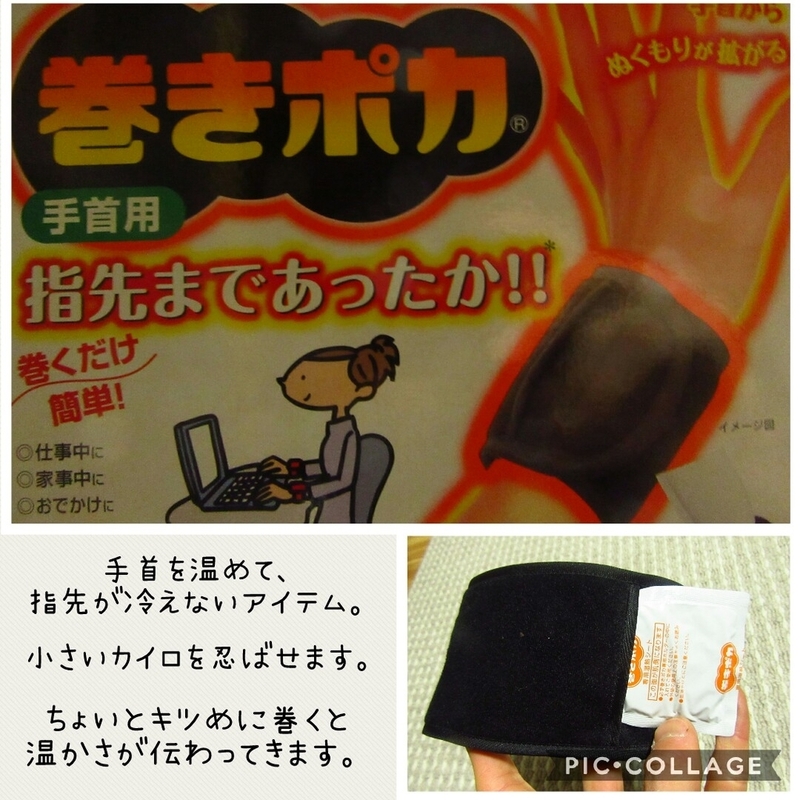 2nd is items that warm your hands. It name is 「Maki-poka」. It is an item to be wrapped around the wrist. Small hot cairo enters in item. Cold person can use this item. The last is event in February. 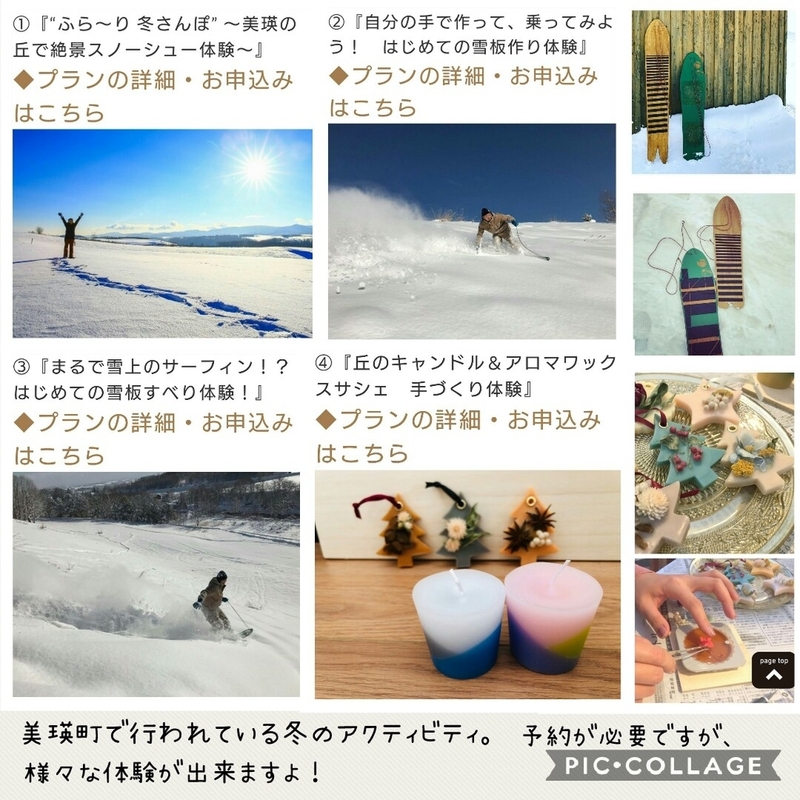 「Yamabe yukinko festival」will be held in Furano city. 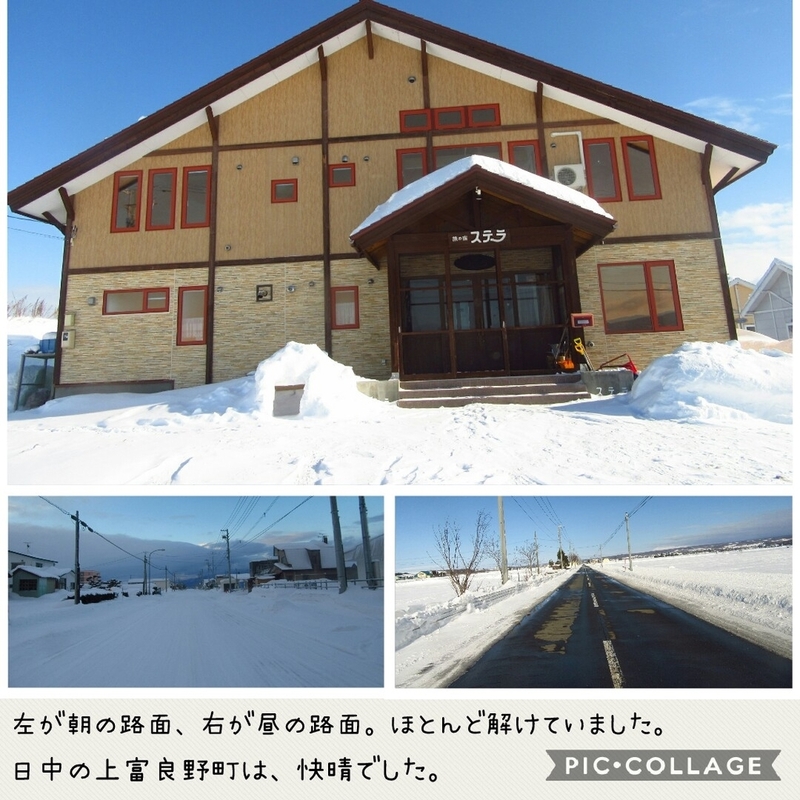 It takes about 20 minutes by car from Furano main area. Winter fireworks will be very beautiful. 31th will be snowy after cloudy in town. 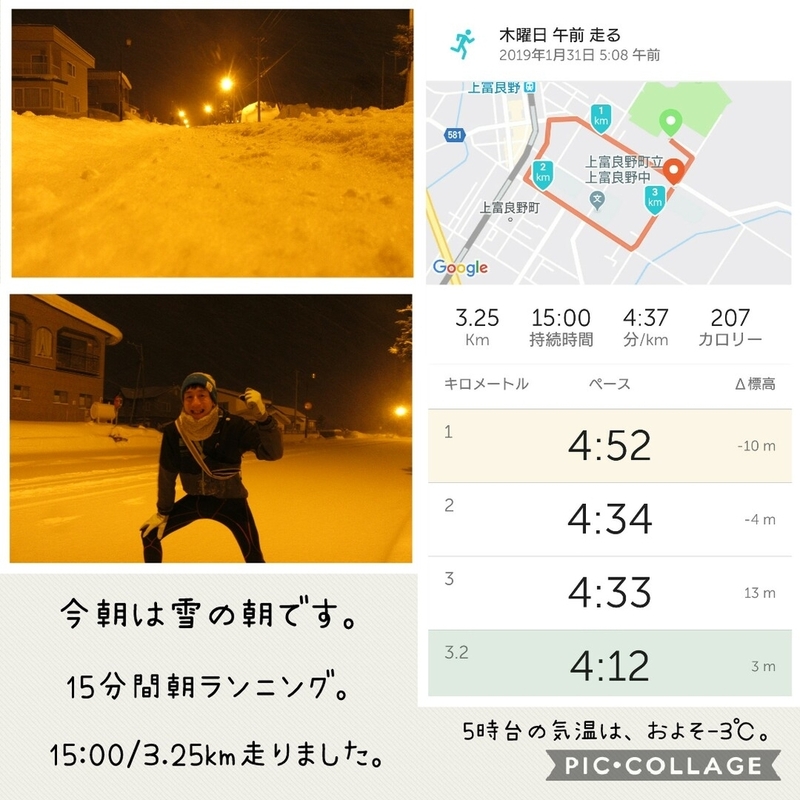 The temperature was minus 3.6 degrees on 6 o'clock in the morning. It was warm morning today. 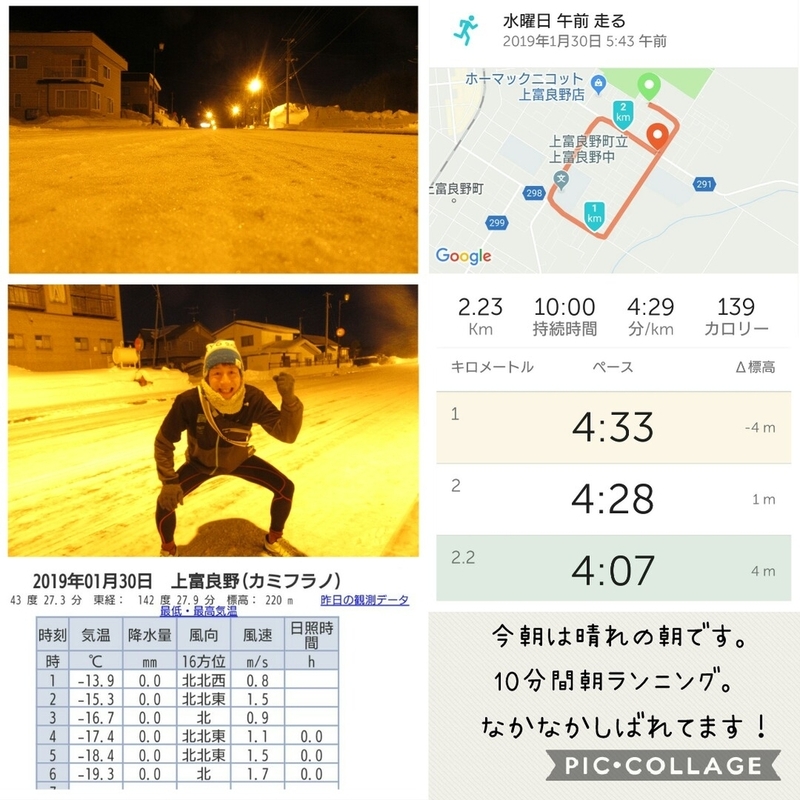 The road in the morning was frozen enough, so we should be careful. The road snow was melted in afrernoon. But it was frozen in night, so we should be careful winter drive. After work, I run about 13 kirometers. 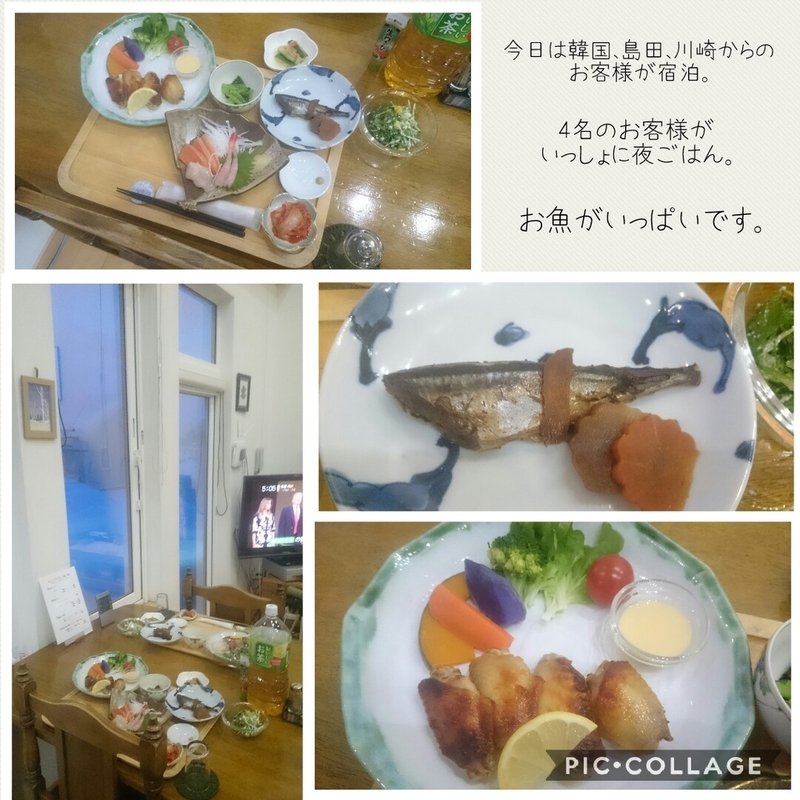 The last is winter activity in Biei town where is close to kamifurano town. Shirogane-bilke road station is near area Blue ponds and Shirahige-waterfall. We can enjoy to ride banana boad. And we can enjoy winter snow world in Biei. 30th will be sunny in town.